Thermal Remediation - Electrical Resistance Heating is based on heating by passing alternating current through the subsurface. ERH has gained wide acceptance over the last 20 years for treatment of source zones with volatile organic contaminants. The most common applications have been for relatively shallow chlorinated solvents sites in silt and clay settings. Heating is based on passing electricity through the formation between electrodes, customized to site conditions. ERH can be combined with less aggressive methods for complete site and plume restoration (e.g., see Thermal Remediation - Combined Remedies). The principle of ERH is to heat the treatment volume by passing electricity through it, causing the soil and water to heat to temperatures that mobilize the contaminants for extraction (Fig. 1). 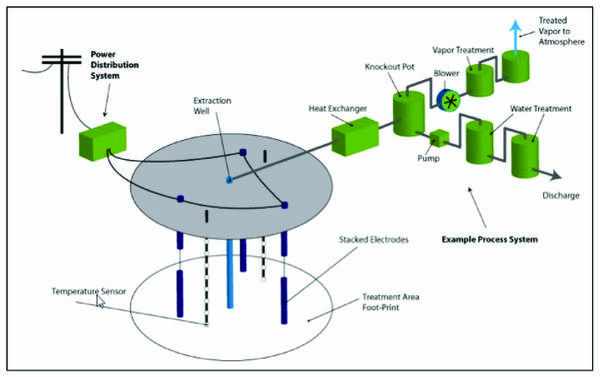 Typical ERH systems utilize three-phase alternating current applied to buried electrodes spaced systematically throughout the thermal treatment zone (TTZ) in a triangular pattern. For sites with treatment zone thickness over 5 meters (16 ft), multiple electrodes may be stacked to provide heating. Contaminants are removed by extraction from the electrodes and/or from separate extraction wells. A cooling and treatment system is then used to separate and treat the extracted water, steam, air and contaminants on site. Figure 1. Electrical Resistance Heating Schematic (courtesy of TerraTherm). ERH requires the presence of water to conduct electricity, and therefore can be applied at low (<100°C) and moderate (~100°C) temperatures to accomplish the remediation of a wide variety of contaminants, both above and below the water table. In a modification of ERH known as Electro-Thermal Dynamic Stripping Process (ET-DSPTM), water is extracted and treated in separate wells, then recirculated into custom electrodes to facilitate heating by inducing convection. This expands the use of ERH to more permeable formations, since some of the injected water is turned into steam, which adds to the heating. ERH is scalable and well-suited for relatively low permeable sites, such as clays and silts. When combined with Thermal Remediation - Steam, effective solutions are available for sites with substantial groundwater flow as well. Since ERH is based on passing current through the formation, a good understanding of the subsurface layers and their electrical properties is essential. When the treatment zone is well delineated, and the ERH system designed and implemented correctly, high removal efficiencies can be achieved. Savannah River Site: An early variation of ERH (6 phase heating) was used to demonstrate effectiveness for a chlorinated solvent hotspot. Lawrence Livermore National Laboratory – Gas Pad: ERH was combined with steam injection to demonstrate treatment of a deep gasoline spill. Young-Rainey STAR Center: ET-DSP and steam enhanced extraction was combined for treatment of a 35-ft deep source zone in complex geology. The application of ERH has since become more common, and not where multiple simpler case studies exist where relatively small TCE and PCE sources have been remediated. Unfortunately, few of these cases are published. Thermal Remediation - Electrical Resistance Heating can be used to treat volatile organic compound (VOC)-contaminated source zones to low levels in tight formations such as silts and clays. By heating the target volume to near the boiling point of water, contaminants are volatilized and removed for treatment or destruction on site. ^ Newmark, R.L. (ed.) 1994. Demonstration of Dynamic Underground Stripping at the Lawrence Livermore National Laboratory Gasoline Spill Site. Final Report UCRL-ID-116964, Vol. 1-4. Lawrence Livermore National Laboratory, Livermore, CA.